Fit matters when it comes to using a surgical handle and blade! An incorrect fit will leave blade loose resulting in poor results. Or it mat be too tight which could lead to a blade breaking. For correct fit there should be no gap between the back end of the blade and the front end of the surgical handle where they come together. It should fit snug, yet still have a little bit of give. But do you know what handle you need for the blade you are using? Does the terminology #3 fitment or #4 fitment mean anything, or does it sound like a foreign language? Let us help clear up any confusion! The fitment refers to the die-cut opening in the blade and the corresponding attachment portion of the surgical handle. All of the blades and handles in our portfolio are manufactured according to the international specs, which means they will fit correctly together every time. Some blades and surgical handles on the market today have been designed specifically for use together and are not compatible with any other brands. Not here at Cincinnati Surgical! Our blades are designed to work with both conventional #3 and #4 fitment surgical handles. This even includes our special safety KLEEN Blade Management System. So what this mean, is our blades fit on most conventional handles available in the market. As long as the surgical blade being used is manufactured to the correct fitment standards and has not been worn down or damaged, it will fit. In addition to the conventional handles listed above, we have more handle options available. The grip portion of the handle may be thicker or longer. 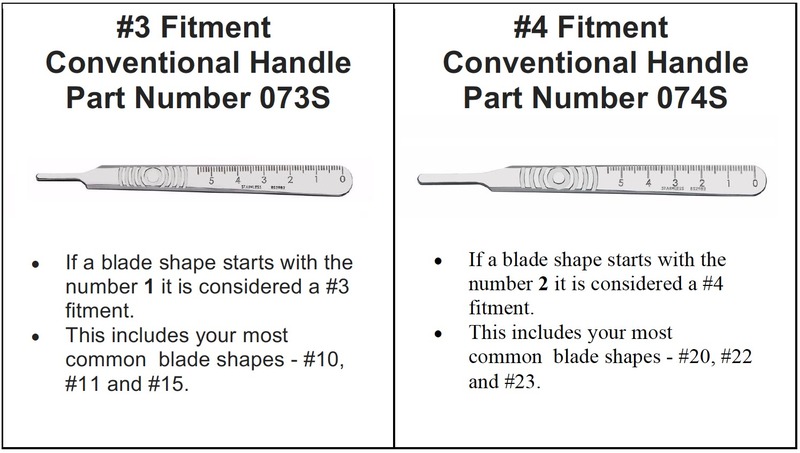 No matter what the handle looks like the fitment is still consistent with the measurements of # 3 and #4 fitment blades. To get additional information on properly attaching and removing a blade from a handle click here. We also have video resources available to help with the process. To find out more about more about converting your blades to the global leader in surgical blade manufacturing call our office at 800-544-3100 or email csblades@cincinnatisurgical.com.